You can learn a lot about life by watching ducks. One summer afternoon, years ago, we took our young children to the park to feed the ducks. These beautiful creatures seemed to float effortlessly above the water. Even when they thrust their heads below water to retrieve food, when they came up the water simply rolled off, hence the proverbial saying, “like water off a duck’s back.” These ducks were totally unaffected by, even impervious to, the water. I thought about the difficulties and stresses of life. What if we could learn to rise above them as easily as a duck floats on water. 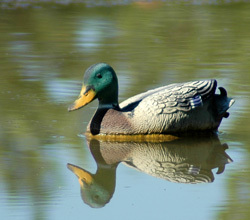 How wonderful it would be, if challenges, pain or disappointment rolled off of us like water off a duck’s back. Later that day, I learned how to make that happen. We had taken our children to our community swimming pool. As I watched our children enthusiastically play in the water, I noticed that, unlike the ducks, we humans are much more affected by the water. When we jump in, we are immediately engulfed and we tend to thrash around trying to keep our heads above water. She’s right, treading water with all our might is one way to stay above water. But another way, equally effective, is to relax, breathe deeply, and float. Think about that the next time you feel the water rising around you and you are stressed out, emotionally thrashing around, trying to keep your head above water. If you will take a moment to relax, breathe deeply, and visualize yourself slowly rising and floating above the stresses and challenges, you will find that your stress level lowers and you can more calmly and effectively deal with the issues of the day. Success Tip: Take 5 minutes, several times a day, to relax, breathe deeply, and visualize floating above the stressful current of life. Imagine your problems and challenges rolling away—like water off a duck’s back. I do think this is an important teaching, to make life issues and stresses roll off. This is part of what you do to train and motivate others. Taking your kids to feed ducks taught you a powerful lesson. Thanks for sharing it with the world.